Photographer Shealah Craighead took this picture of former First Lady Laura Bush in 2008 when Uno, that year's Westminster Best in Show winner, was introduced at the White House. Shealah Craighead is in the running to become Donald Trump's chief White House photographer. Craighead previously worked in the White House during the George W. Bush administration. She photographed Trump at the inaugural balls on Friday night, and the photography world is abuzz that she might be the Trump pick. Press secretary Sean Spicer said Saturday that a director of photography has not been named yet. Craighead, he said, is one of the photographers working with the new administration. According to a person who has been in contact with the Trump administration, Craighead is on something of a tryout. "She is at the top of the list," the source said. But new presidents often want to make sure they are comfortable with the person who will be following them around snapping photos all the time. That's why no announcement about the position has been made yet, the source said. The White House photographer position is one-of-a-kind. The photographer is sometimes the only person in the room with a camera when history is made. Witness Pete Souza's famous Situation Room photo of President Obama and top aides during the Osama bin Laden raid. "Souza is the photographer who gets to stay in the room when all the other photogs are shooed away -- when just about everyone is shooed away," a Washington Post profile of him said in 2009. "In the pressurized atmosphere of the presidential bubble, Souza gets to disappear into the molecules, hoovering moments the rest of us could only dream of seeing." Souza had previously worked for President Ronald Reagan. In the mid-2000s, he photographed then-senator Obama while working for the Chicago Tribune. Obama hired him before inauguration day in 2009, and Souza worked for all eight years of the Obama presidency. His last day was Friday. He said on Twitter that he'd be catching up on sleep in the days to come. In 2006, Shealah Craighead took this photo of First Lady Laura Bush with Ronald Spogli, U.S. ambassador to Italy, at a world conference in Rome about hunger and AIDS. 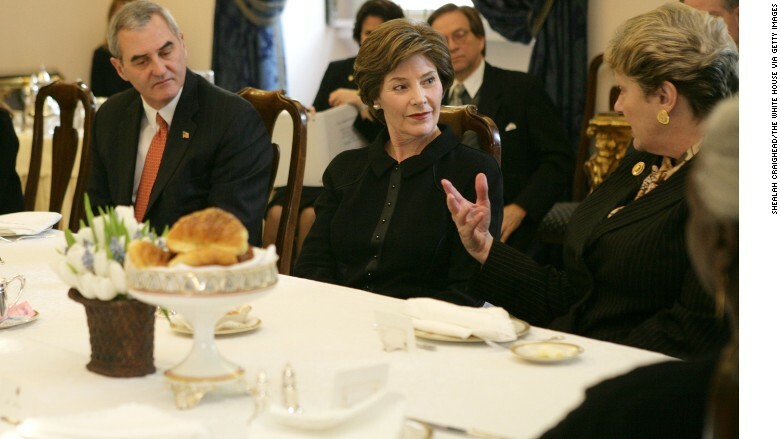 Craighead's website features images from her time working with the Bush family, including as personal photographer for First Lady Laura Bush. She also photographed Sarah Palin's vice presidential campaign. Reached by phone at an inaugural ball on Friday night, Craighead declined to comment. But she has registered a new Twitter handle: @shealahphoto45. She hasn't posted anything yet. More importantly, for photo buffs, she has a personal account on Instagram.